Fellow Internet marketer and blogger, Tyler Cruz, is hosting yet another contest. Who doesn’t like free stuff?! $11,475 worth of prizes are up for grabs! 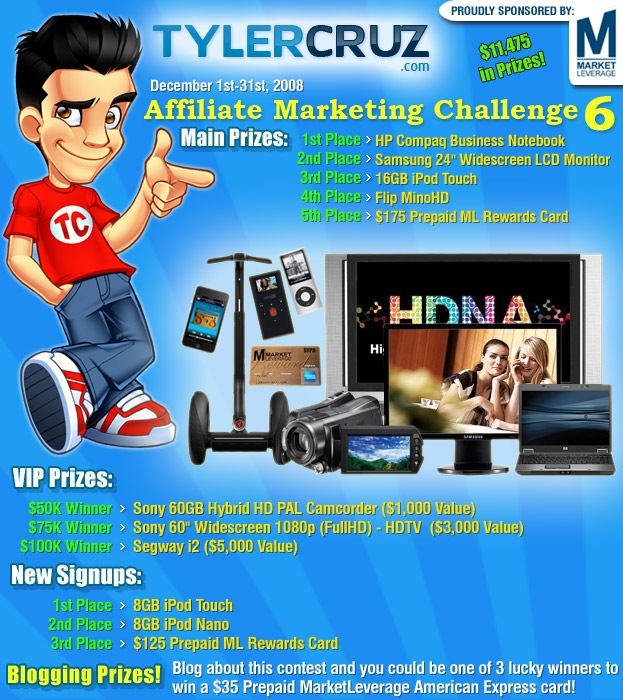 Tyler has launched Affiliate Marketing Challenge 6. From now until December 31, you can enter to win some amazing prizes, sponsored by MarketLeverage. Some of the prizes include an HP Compaq Business Notebook, Samsung 24″ Widescreen LCD Monitor, 16GB iPod Touch, Flip Mino HD and more! The big prizes will be awarded to the big money makers who sign up with MarketLeverage and make the most money, as tracked by Tyler. If you’re not a super affiliate just yet, you can still win some good stuff just for blogging about this contest. 3 random winners picked will get a $35 Prepaid MarketLeverage Rewards Card. Take a look at the graphic below for more information. Its amazing how much ML is giving back to Internet society with the sponsorship. Like what you said, who doesn’t love free stuff. I guess you did join the challenge as well isn’t it? Good luck with it. Wow thats a big load of prizes. Definitely attractive enough for people to participate in. Wow. ML is really amazing these days. I really don’t know what to say about them but they’ve been sponsoring contests like crazy.